WASHINGTON, DC [September 21, 2018] — In recognition of the 25th Annual National Public Lands Day tomorrow, September 22, United States Secretary of the Interior Ryan Zinke will join AmeriCorps members of Arizona Conservation Corps (AZCC), as well as staff from American Conservation Experience (ACE), for a service project at Grand Canyon National Park. Members of AZCC’s Veterans Fire Corps Program and young adult program will be involved. Held annually on the fourth Saturday in September, National Public Lands Day (NPLD) is the nation’s largest, single-day volunteer event for public lands. The theme for the 2018 National Public Lands Day is Resilience and Restoration, focusing on the need to address and prepare for the natural and human-caused wear-and-tear that damages public lands and threatens access to outdoor activities. The service project at Grand Canyon National Park will involve painting historic cabins constructed in the 1930s by the Civilian Conservation Corps (CCC), a federal program that put 3 million young men to work on public lands during the Great Depression. 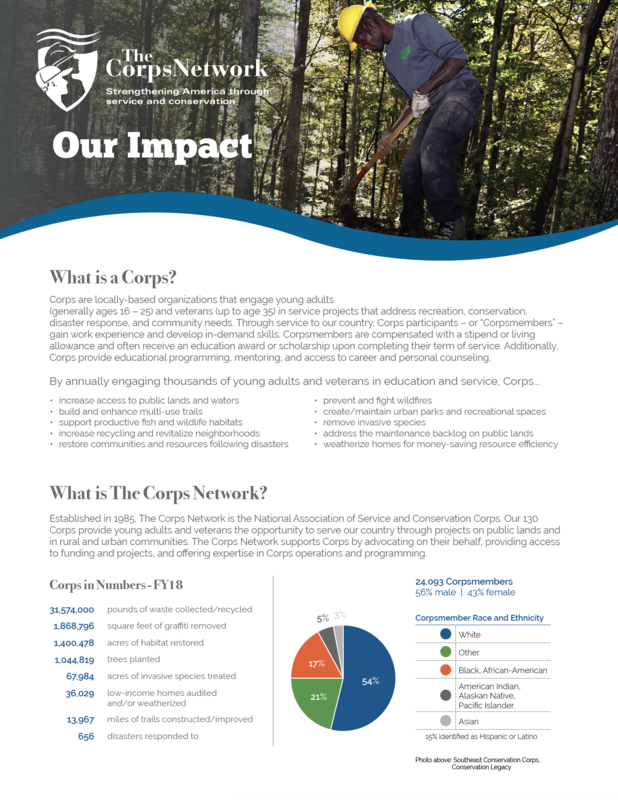 The CCC serves as a model for AZCC, ACE, and other non-profit and state-operated 21st Century Conservation Service Corps of the present day. Modern Corps often help maintain infrastructure developed by the CCC. Preparations for the service project will be conducted by members of AZCC’s young adult program. Secretary Zinke will then participate in the paint restoration work with AZCCVeterans Fire Corps (VFC) members. The VFC is an AmeriCorps program that provides pathways to civilian careers by offering training and hands-on project experience to post-9/11 veterans interested in careers in natural resource management and wildland fire. Prior to the Service Project, Secretary Zinke will take a bus tour to view various locations throughout the park where Corps, concessionaires, and other outside entities can or have helped the National Park Service address deferred maintenance through public-private partnerships. The National Park Service has nearly $12 billion in backlogged projects. Following the bus tour, the Secretary will lead a press event to discuss the Restore Our Parks and Public Lands Act, a recently-introduced bipartisan bill that would address the deferred maintenance backlog on public lands by creating a fund – called the National Park Service and Public Lands Restoration Fund – using federal energy development revenue not otherwise allocated. “We look forward to serving alongside Secretary Zinke on National Public Lands Day to help repair critical infrastructure at Grand Canyon National Park,” said Amy Sovocool, Co-CEO of Conservation Legacy, the parent organization of AZCC. Throughout the country, numerous non-profit and state-operated Conservation Service Corps partner with the National Park Service, as well as other federal, state and local resource management agencies, to annually engage thousands of young adults and veterans in maintenance projects on public lands. Through private-public partnerships, Conservation Corps completed more than $45 million in maintenance and improvement projects on Department of the Interior properties in 2017. Corps are presently authorized to partner with federal land management agencies through the Public Lands Corps Act of 1993. To update this legislation, a bipartisan bill known as the 21st Century Conservation Service Corps Act (S.1403, H.R.2987) is currently under consideration in the United States Senate and House of Representatives. Among other provisions, the “21CSC Act” would allow federal land and water management agencies to create formal, more flexible partnerships with 21st Century Conservation Service Corps. It would also enable additional federal agencies to more easily partner with Corps to accomplish their goals. Secretary Zinke was a cosponsor of the 21CSC Act in his previous position as a United States Representative for Montana. The 21CSC Act complements the Restore Our Parks and Public Lands Act in that it would help provide additional young adult and veteran Corpsmembers to serve on maintenance projects made possible by the National Park Service and Public Lands Restoration Fund.